TOKYO, January 19, 2012 – Casio Computer Co., Ltd., today announced that it will consecutively release two types of synthesizers designed under unique new concepts in spring 2012: the XW-G1, a groove synthesizer that combines the functions of the various digital equipment used by club DJs in a single unit, and the XW-P1, a true performance synthesizer particularly designed for creating sounds for live performances and playing expressively. Featuring a slim body and weighing only 5.4 kilograms, both models are equipped with nine sliders and four independent assignable knobs, making it intuitive and easy for users to control a wide array of sounds. The XW-G1 is a synthesizer that lets users enjoy many of the features club DJs use on their digital equipment. The functions of various DJ gear are included in this all-in-one unit, including its Step Sequencer for selecting an array of rhythm patterns, Phrase Sequencer offering preset phrases that spice up DJ performances, and Sample Looper for digitally samplin rhythm patterns, keyboard performances, or externally input sound allowing overdubbing. Using the built-in 61-key keyboard, users can not only play the keyboard live while using rhythm patterns as backing tracks, but can also use the keyboard to call up features quickly while DJ-ing, giving them real-time control of the instrument’s cool club sounds. The XW-P1 is a synthesizer particularly designed for creating sounds and playing expressively in live performances. This model features 620 preset tones, including Solo Synthesizer presets that reproduce vintage analog synthesizer sounds, Hex Layer ensemble sounds that comprise as many as six tones, and Drawbar Organ presets that can be controlled using nine sliders functioning as drawbars. A wide array of sounds can be created using the preset tones and a wide range of internal waves. Moreover, the XW-P1 is loaded with various functions to give discerning performers more power of expression, including the Performance function that allows performance setups to be independently assigned for up to four designated keyboard zones. The XW-G1 is a groove synthesizer equipped with a keyboard and loaded with the functions of the various kinds of digital equipment used by club DJs, including the ability to create and play back a variety of rhythm patterns and musical phrases, all in a single unit. Users can enjoy playing an all-in-one instrument that enables control of cool sounds via sets of nine sliders, 16 Step Sequencer buttons and four assignable knobs arranged on the left side of the top panel. CASIO has currently given six keyboards and four digital pianos a facelift and is now sending them into the race for popularity amongst the buyers with sound improvements, functions that have been further optimized and the likeable prices they are known for. The many improvements made on the details of the still quite new models prove that CASIO has the correct answers ready in the highly competitive start-up keyboard market as well as in the important compact piano segment. The new models in the standard series are known as CTK-2200, CTK-3200, CTK-4200 and WK-220, in the key lighting series they are the models LK-220 and LK-280. All of these start-up keyboards now have the high-quality AHL sound source with 48 notes, and a power adapter is included in delivery with all of them. With USB-to-host (MIDI) and Plug & Play, the new keyboards are also state-ofthe- art in terms of connectivity. One great feature is AUDIO IN: when a CD or MP3 player is connected to the audio input of the keyboard, the songs are broadcast over the keyboard’s loudspeakers as “halfplayback”. This turns a jam session with one’s favourite musicians into reality. Regardless of this group assignment, all new models – except the CTK-2200 – have touch response. The two key lighting keyboards are delivered with a microphone. The two new models in the popular compact series are known as CDP-120 and CDP-220R. The CDP- 120 now also has the AHL sound source from CASIO as well as a hammer action keyboard with two sensors, derived from the PRIVIA series. In addition, the basis instrument was equipped with a USB interface and now has an even more compact design. 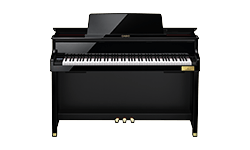 The CDP-220R was furnished with an addition 30 tones (for a total of now 700) and can be effortlessly switched from piano to organ tone by means of the new piano/organ button. A chord book is included as well in the delivery of the multi-functional ensemble piano. The PX-135 and PX-735 have been newly introduced in the PRIVIA series. The successors of the former top sellers (PX-130 and PX-730) offer two new grand piano tones, increasing the tones from 16 to 18. The colour concept was changed in the process: The PX-135 is available in black (BK) and white (WE), the PX-735 in black (BK), brown (BN) and white (WE). Casio Computer Co., Ltd. is one of the world‘s leading manufacturers of consumer electronics products and business equipment solutions. Since its establishment in 1957, Casio has strived to realize its corporate creed of „creativity and contribution“ through the introduction of innovative and imaginative products. Today, Casio‘s offerings include timepieces, digital cameras, electronic dictionaries, calculators, musical instruments, system equipment, and others. The Casio Group employs more than 11,000 people worldwide, shipping over 100 million products per year, with net sales of 341 billion yen (approx. US$ 4.1 billion) in the fiscal year ended March 2011. News and product information from Casio is available at www.casio-europe.com. CASIO rang in a new era in the keyboards sector with their new high-grade series. Since winter 2010, the WK-7500/WK-7000 as well as the CTK-6500/CTK-6000 have catapulted the „middle class keyboard“ category to an entirely new level. What the arranger keyboards have to offer in terms of what is possible for creative sound editing is unparalleled in this price category. The “Oriental series” was also added at the beginning of this year: the AT-5 and AT-3 are technically based on the high-grade models and make it possible to play traditional Turkish and Arabian music true to style. 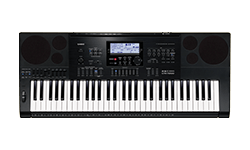 The current flagships of the new keyboard series from CASIO not only have a generous 800 tones, 250 rhythms and a 32-channel mixer at their disposal, but also an integrated microphone input and come with a high-performance 2-way bass-reflex system. Furthermore, they allow one to create and save up to 100 original sounds and to mix just as many DSP effects. Another highlight is the recording possibilities: songs and accompaniments played can be saved as song files in standard MIDI format (SMF) or as audio files directly on the SD card. In addition, audio-recording/playback offers the possibility of not only recording the keyboard playing live, but also simultaneously recording a microphone signal and further instruments (via INST IN). The Oriental variations of the multi-function creative keyboards offer samples of the most important Oriental instruments (54 tones) and accompanying functions with Oriental rhythms (83 accompanying rhythms). It’s also possible to set the keyboard to quarter tone steps and one’s own tunings (scale function) and to save them using the memory function (scale memory). During Musikmesse 2011, CASIO invites all keyboard enthusiasts to get to know the many technical possibilities of the two new keyboard series. From arpeggiators to drawbar organs, CASIO covers it all – competently presented by two of the tried-and-true CASIO promoters: the likeable keyboard freak Ralph Maten presents the high-grade series while musician Merih Aktoprak, a Hamburg resident with Turkish roots who convincingly represents the instrument’s philosophy, is responsible for the Oriental series. Put your headphones on and dive in: at the keyboard workstation, Ralph Maten gets to the bottom of the high-grade series‘ many creative possibilities with help from the WK-7500 and shows hands-on how the top model can be individually adjusted to suit one’s needs and desires. CASIO placed particular value on the simple operation of its arranger keyboards, a fact that Ralph Maten can impressively prove. The trade fair visitors can communicate directly with Ralph Maten over headsets and ask him for his insider tips. Every day at Musikmesse! What does Oud, Nay or Quanun sound like? On the AT-5, Merih Aktoprak will take you on a journey to the exciting world of Oriental instruments. Whether traditional Arabic folk music or modern Turkish pop – the likeable musician will bring the many sound possibilities of the Oriental series to life. Every day at Musikmesse! Hall 5.0, Booth A48: CASIO presents its keyboards and digital pianos at their usual spot in Hall 5.0. As always with lots of opportunities to take the instruments on a test run and to receive some intensive advice. Kanun, Al-Oud, Nay – these are typical Oriental instruments that belong to the repertoire of many musicians with Turkish or Arabic roots. In its new keyboard series, CASIO now makes the authentic sounds of such traditional flutes, string instruments and drums available for all lovers of Oriental music. With it, CASIO as an international company fulfils the wish for ethnically-specific instruments and taps into new target groups. The new “Oriental Keyboards” do of course not only offer samples of the most important Oriental instruments and accompaniment functions with Oriental rhythms, but also the possibility of setting the keyboard to quarter tone steps and one’s own tunings and of saving them with the memory function. The focus was on authenticity and sonority when the specific sounds and rhythms were being developed. The new Oriental Keyboards are technically based on the current high-grade models – they offer the same broad range of possibilities for creative sound design and ambitious songwriting. Whether for modern Turkish pop or traditional Arabic folk music – original worlds of sound will come to life with the Oriental Keyboards AT-3 and AT-5. AT for Arabic Tone. The new series will be positioned on the market with the – for CASIO – new description of AT for Arabic Tone. The AT-3 is based on the high-grade top model CTK-7000 (61 keys), the AT-5 on the high-grade top model WK-7500 (76 keys) – guaranteeing a huge choice of sounds: in both new AT models, 83 of the 250 total rhythms and 54 of the 800 total sounds are Oriental in nature – the keyboarder therefore has a myriad of possibilities to allow his or her specific musical background to shine through. Quarter tone by quarter tone: The Oriental scale buttons with memory function open the musician up to the possibility of selecting different scale templates and, by fine-tuning the notes, of creating their own scales. The oriental scales with their typical notes are thus authentically playable. With their gold-coloured casing and (in part) Arabic lettering, the new AT models stand out optimally from the high-grade keyboards and signalize their own musical presence.